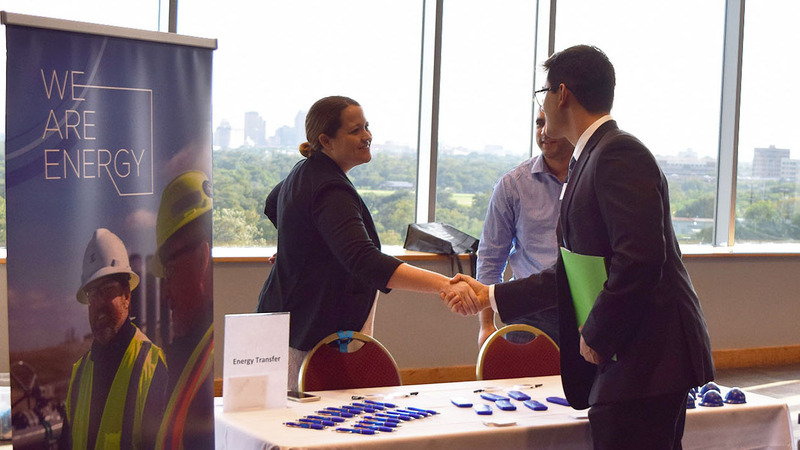 Wednesday, February 13, 2019 | 5 - 7 p.m.
Join the H-E-B School of Business & Administration for a Networking Reception & Career fair on Wednesday, February 13, 2019, in the Rosenberg Skyroom. Network with dozens of companies and nonprofit organizations and learn about exciting career opportunities and internships. Light refreshments will be served. Companies from the public and private sector will be at the event, including local and federal government agencies. Expand the table below to see a full list of employers scheduled to attend. Check back later for a full list of employers. Students are advised to bring several copies of their resume to leave with potential employers. Click here for resources on how to create an effective resume. Professional attire is required to attend this event. Students in blue jeans and T-shirts will not be allowed inside. Click here to learn more about acceptable professional attire. Students are encouraged to register online ahead of time to simplify the check-in process upon arrival at the event. Students who have not registered online may still attend the event and complete the registration process at the check-in table. Online registration for this event will begin in January 2019. Thank you.